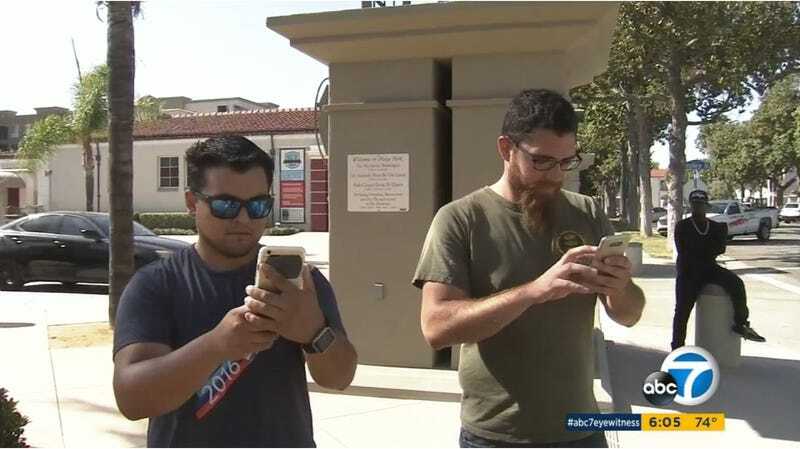 U.S. Marines Seth Ortega and Javier Soch were playing Pokémon Go at a park in Fullerton, California when the game locked up. While waiting for it to unfreeze, they looked up and noticed a man with a plastic red rose approach a woman with three children, KABC-TV Los Angeles reports. The woman and her children ran away and then called the police. Ortega and Soch continued watching the suspicious man as he approached another mother and her kids, who were also in the park playing Pokémon Go. “We see the gentleman go approach them again, at this point, me and my roommate start walking across the street and the gentleman actually walks up and touches one of the children, one of the boys, his toe, and starts walking his way up to the knee,” Ortega said. “At this point I’m running across the street and another gentleman who was walking down the street does the same thing,” Ortega added. The suspect was arrested for alleged child annoyance, KABC-TV Los Angeles reports, and it was later discovered that he had an outstanding warrant out for attempted murder.